Vindicator Editorial: April 19, 2018 at 12:00a.m. 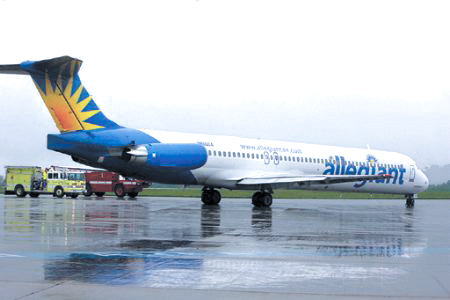 Like many Mahoning Valley residents, we lamented the sudden permanent departure of Allegiant Air after 11 years of service. But after watching the explosive investigative report Sunday on “60 Minutes” that focused on the low-cost carrier’s safety record, we are inclined to say good riddance. Indeed, we’re sure there are Valley residents who had their own negative experiences with Allegiant and, therefore, could corroborate CBS Reporter Steve Kroft’s revelations about the Las Vegas-based airline. Kroft reported that Allegiant has been plagued by a comparatively high number of aborted takeoffs, in-flight mechanical problems and emergency landings in recent years. He quoted from official maintenance records showing that Allegiant experienced more than 100 serious mechanical incidents on flights between January 2016 and October 2017. “The number of in-flight incidents that Allegiant has had speaks volumes, it is simply unacceptable,” Alan Price, a former chief pilot for Delta Air Lines, told the Associated Press. The revelations about Allegiant’s mechanical problems had a familiar ring for Valley residents who experienced flight cancellations and delays in arrivals and departures. The last flight out of Youngstown-Warren was Jan. 4. In an editorial marking the pull out we said, “While the airline sought to blame us for its abandonment, here’s a pertinent reason for the decline in demand: Allegiant made schedule and destination changes that impacted the travel plans of Mahoning Valley residents. It is not an exaggeration to say this region played a major role in Allegiant’s rise to national fame. During the 11 years of serving the Valley, the passenger count remained consistently high for flights to Sanford/Orlando, Fla.; Myrtle Beach, S.C.; St. Peterburg, Fla.; and Punta Gorda, Fla.
From 2009 to 2014, the Vienna Township airport was Allegiant’s fastest-growing service area. This record was established despite the numerous interruptions in service due to mechanical and other problems. That’s why Sunday’s story on “60 Minutes” struck a chord. CBS said that Federal Aviation Administration records it got by filing a Freedom of Information Act request indicate that Allegiant flights were 31/2 times more likely to suffer an in-flight breakdown than flights operated by American, United, Delta, JetBlue or Spirit. The report also aired a long-running accusation by a Teamsters union local representing Allegiant pilots that the airline discourages pilots from reporting mechanical problems with planes. It also took aim at the FAA for failing to take action against the low-fare airline. Allegiant dismissed the CBS story, saying Kroft told a “false narrative” about the airline and the FAA. Eric Gust, vice president of operations, also rejected the suggestion that the airline muzzled employees, calling the charge “offensive and defamatory,” the Associated Press reported. It must be noted that CBS wanted to interview Allegiant CEO Maurice J. Gallagher Jr., but had to settle for a statement from an underling. On the other hand, Kroft questioned John Duncan, the head of FAA’s flight standards, extensively about the federal agency’s response to the airline’s safety record. Duncan was like a deer caught in the headlights. He seemed lost for words when pressed by Kroft to detail the steps taken by the agency to ensure that the airline is in compliance with FAA rules and regulations and maintenance standards. Duncan’s answers failed to reassure a skeptical public that Allegiant’s performance problems are a thing of the past. The airline says it plans to retire all its MD-80 planes, which are nearly 28 years old on average. These aging aircraft require more maintenance than newer planes. The FAA must know that it is now on national notice, as a result of the “60 Minutes” report. The agency will be blamed if there is a crash and passengers are killed or injured.